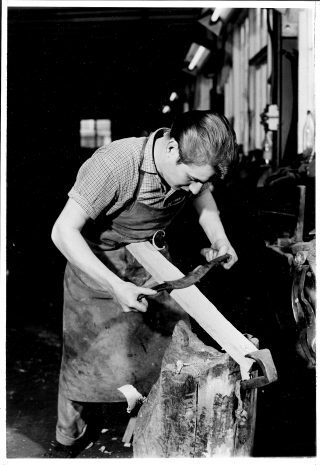 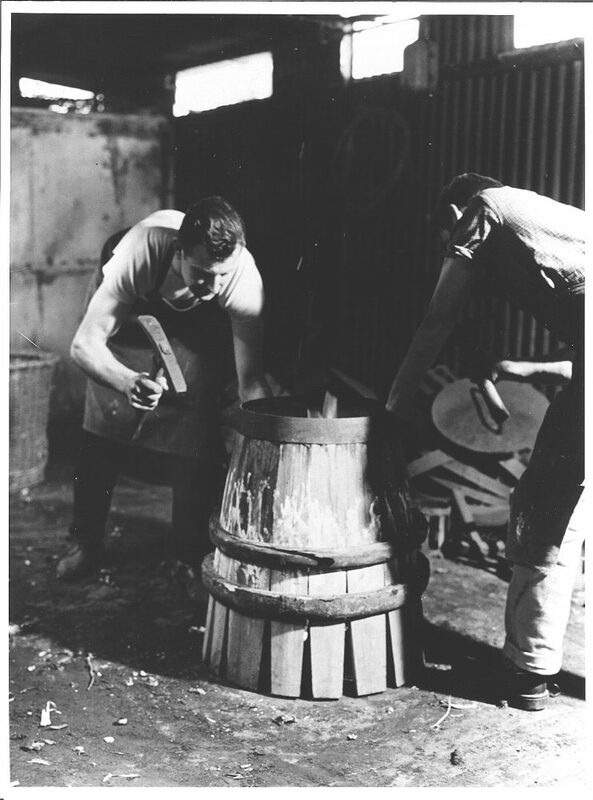 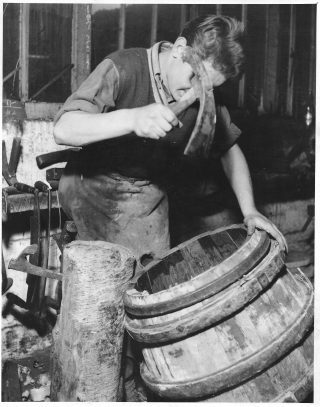 Often joining the trade straight from school at or before the tender age of 16, they served 5-7 years as an apprentice Cooper, until they were capable of producing whole barrels to exacting standards. Young Coopers then had to undergo the initiation ceremony known as ‘Coming Out’ or ‘Rolling Out’ to become a ‘Journeyman Cooper’. These images record the process for 21 year old Maurice Cooper following his 7 years apprenticeship. 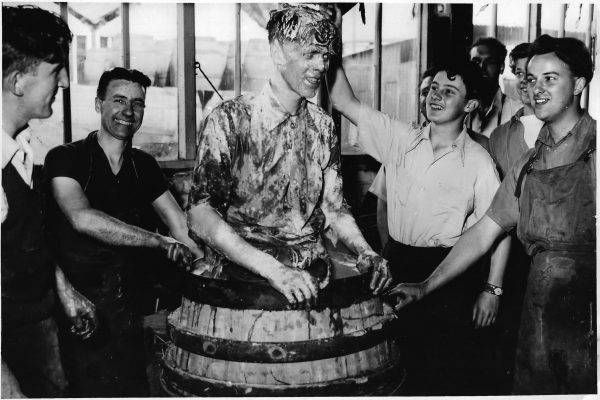 He was initiated at the Reading Brewery, in March 1953. 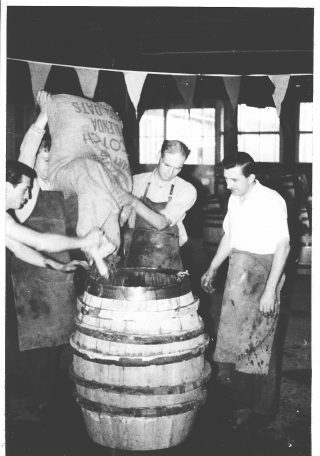 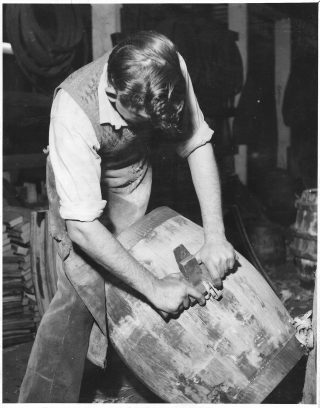 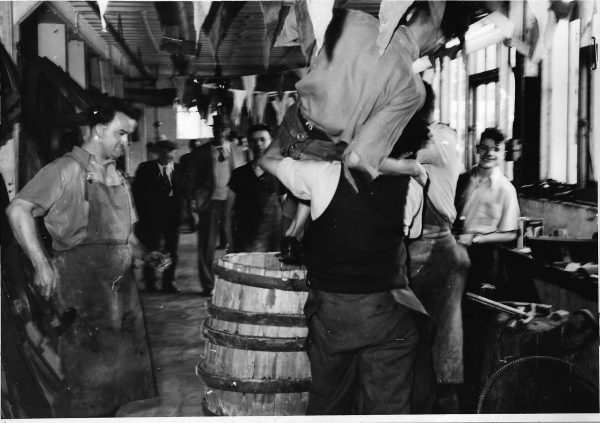 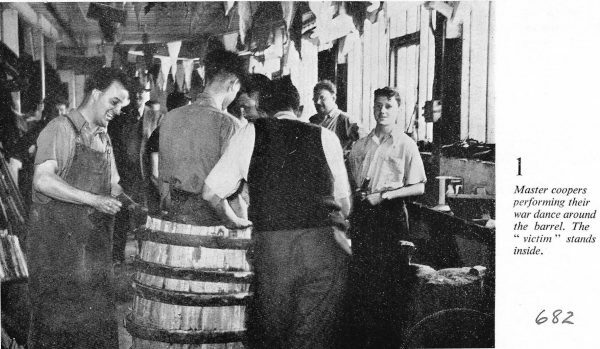 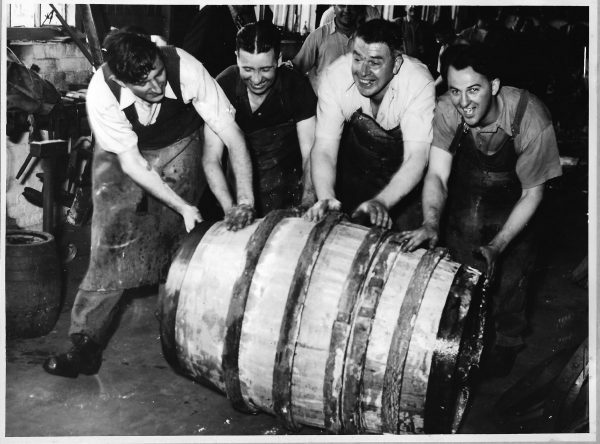 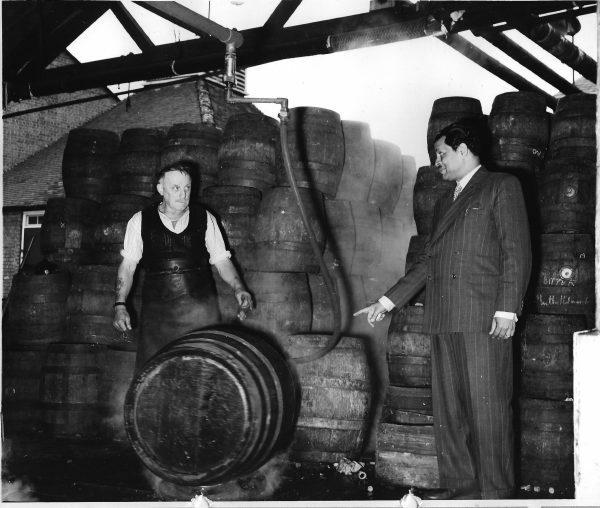 Maurice is manhandled into the barrel that he has made, by his colleagues. 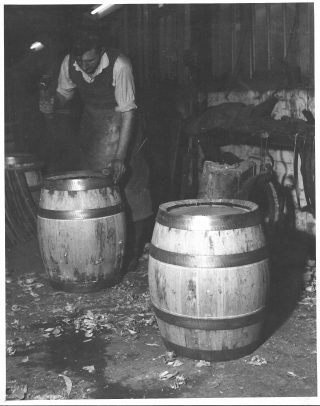 Maurice is covered in a ‘muck’, usually made of ‘Pompey juice’ which is the gue that collects in the bottom barrels as they are steam cleaned, with added soot, feathers, shavings & even beer. They are then rolled ceremoniously round the Coopers yard before the outside of his barrel was hammered by a dozen strong-armed coopers. 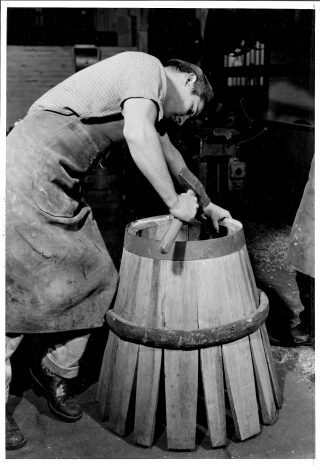 They help him out, to be christened a qualified Journeyman Cooper, a practitioner of the ancient craft of barrel making. 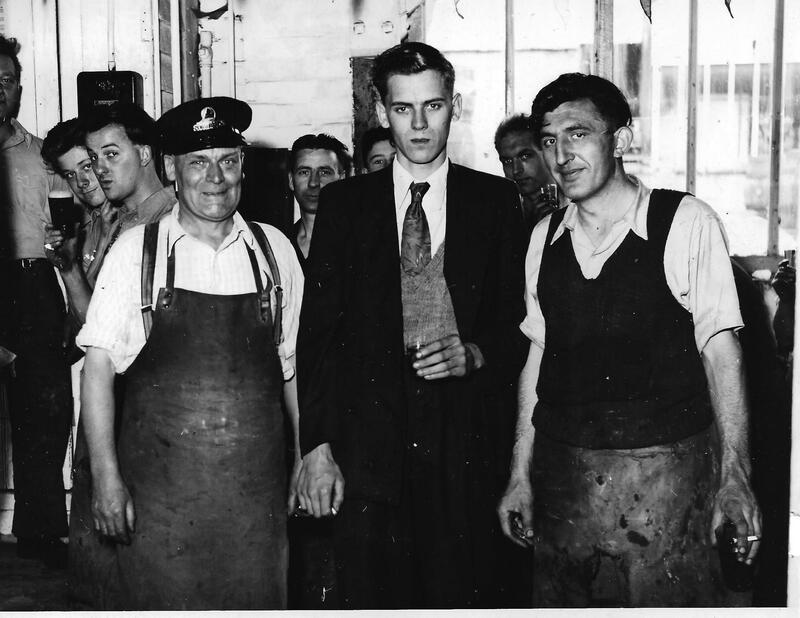 My father, Duncan Simonds, then Managing Director, presents the proud but mucky lad with his ‘Coopers Indentures’. Maurice, now smartly suited, stands with his proud father, Maurice Butler senior on his left. 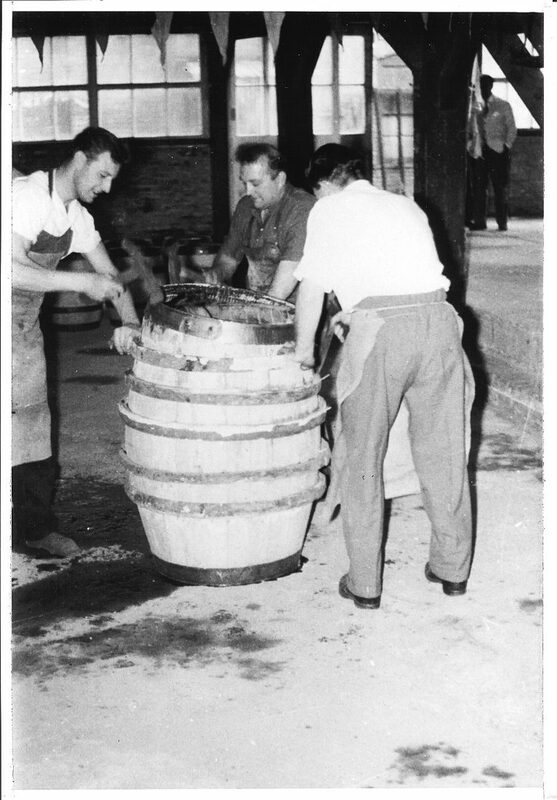 They are joined by Mr Ron Staunton to whom Maurice junior has been apprenticed for 7 years! Coopers past and present at the celebration. 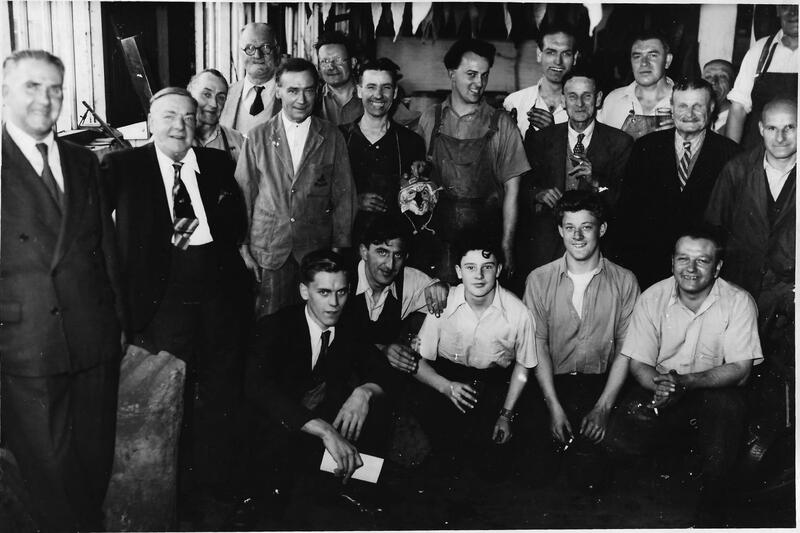 Front row on the right is Ron Champion who was there from 1930’s to 1970’s. 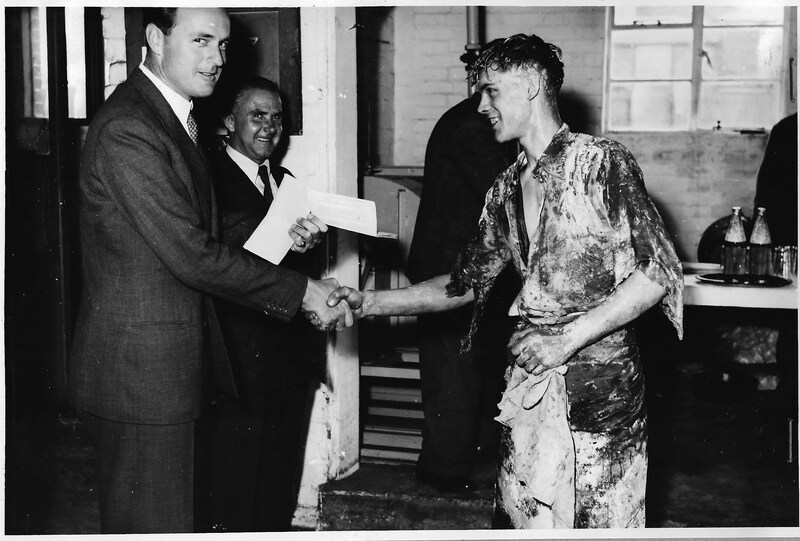 Next to him is Terry Winterbourne. 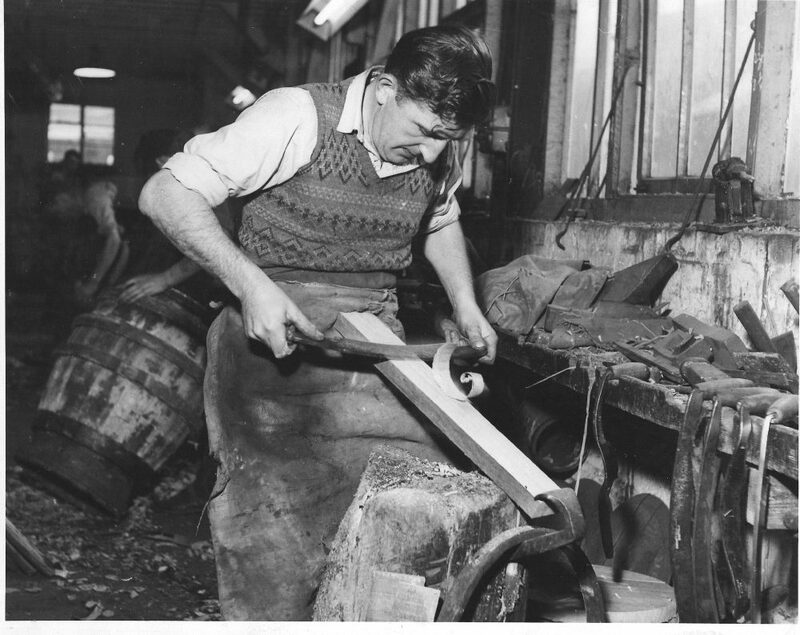 I am told that the last two Journeyman Coopers to pass out were Roy Hodges and Terry Winterbourne. 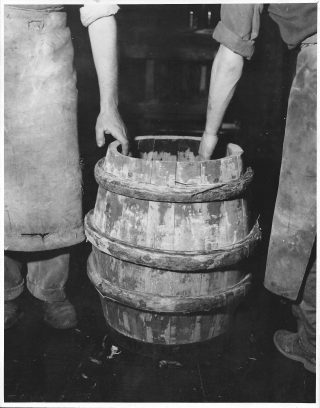 That still left the barrel to be steam cleaned and put into service! 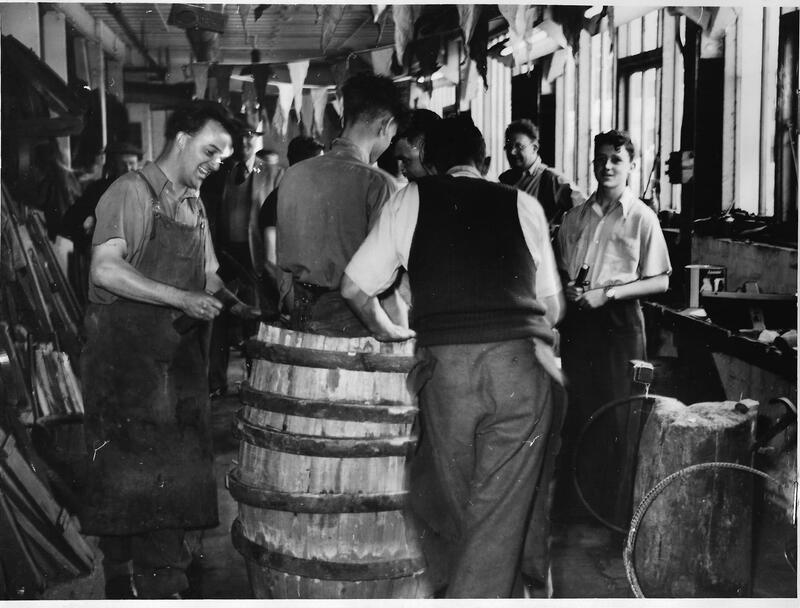 When the Coopers Yard was demolished in about 1979, there was no call for Coopers at the huge new ‘Reading Brewery’, then the largest in Europe, which used only aluminium kegs. 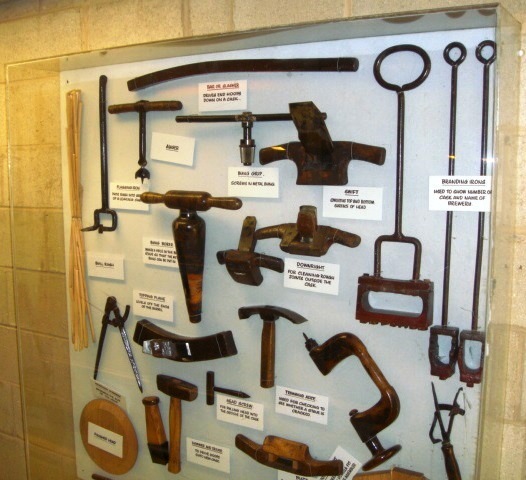 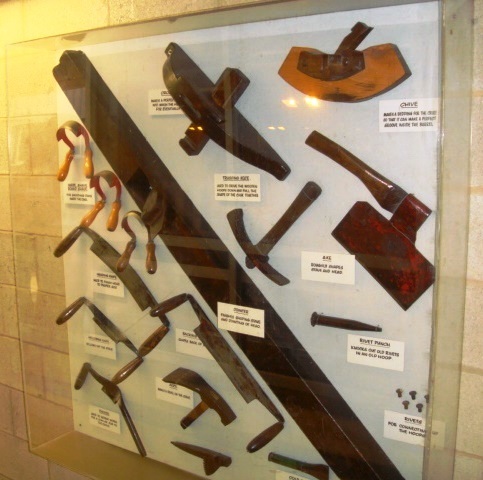 But the tools were saved and put on display there, where they remained for 30 years till its closure in 2009. When they were passed to a brewery museum – I think in Staines? 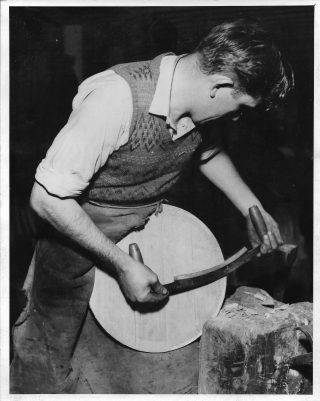 Can anybody fill this gap or offer better images please?